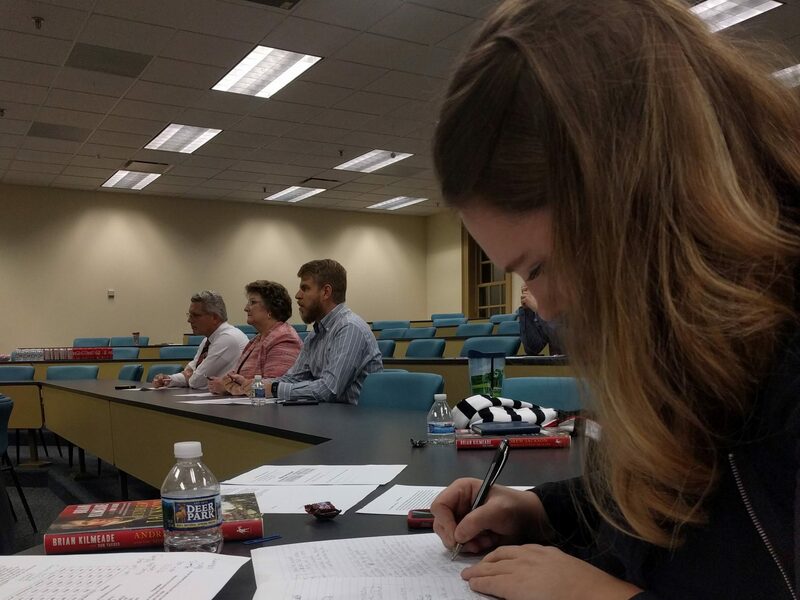 Nov. 29, 2018 – American Majority facilitated a three hour Campaign-In-A-Day Snapshot sponsored by the Robertson School of Government where students learned about how campaigns are run and were given the opportunity to run their own. The evening began with a presentation from American Majority’s National Executive Director, Matt Batzel, who explained the stages of a campaign: planning and research (such as analyzing voting patterns), introducing the candidate to the voters, persuasion, and GOTV (airing numerous television advertisements in the last months leading up to the election). The students in attendance were split into two groups, each supporting a candidate for state senate. For the project, they were given their candidate’s and opponent’s profiles, as well as information about the district that they were running in. Each campaign had to determine the needed voter turnout to win; choose which events their candidate or staff would attend; rank the best places to recruit volunteers; allot money for the campaign budget; create a slogan and a 30-second radio ad; rank which journalists to use for coverage of the candidate and explain why; and each candidate had to give a one- to two-minute speech before judges, and explain the meaning behind their slogan and their budget priorities. At the end, the judges determined which candidate won based on their radio ad, performance, and answers to their questions: either Republican Clint Garrett, who was role played by Geoffrey Still (’20) College of Arts & Sciences, or Democrat Janelle Fields, who was enacted by Catherine Jessberger (‘18) Robertson School of Government. The winner was Janelle Fields. Still said of the workshop that it was good to get insight on how campaigning works since he wants to manage one, as well as getting to see things through a different lens as the candidate. Still added that while he ran a cleaner campaign than his opponent, it was good to share the experience and see how it was to be attacked and how to deal with it. Jessberger said she learned a lot from what was “like a crash course.” She said that the time limit for the workshop (and thus for creating a campaign) kept her on her toes. Also, Jessberger mentioned that she found it interesting the amount of money spent on certain aspects of campaigns, and the fact that direct mail isn’t as effective as other advertising tools. The Interim Dean at the Robertson School of Government, Stephen Perry, said that when people are sitting at home watching television, they don’t realize all the different pieces of campaign planning. This event allowed students to have a fuller insight into all the details, the pros and cons and do’s and don’ts of campaigning, and gain some experience with creating a fake campaign. Dr. Perry added that students should take advantage of these co-curricular workshops, where they can meet the presenters and network with them, as well as getting experience that they can take back to the classroom and see how it fits with the theory they are studying. Natalia Mittelstadt is a staff writer for the Daily Runner. April 15, 2019 Natalia Mittelstadt Comments Off on RU Informed?